Eugene Airport - Convenient and close! 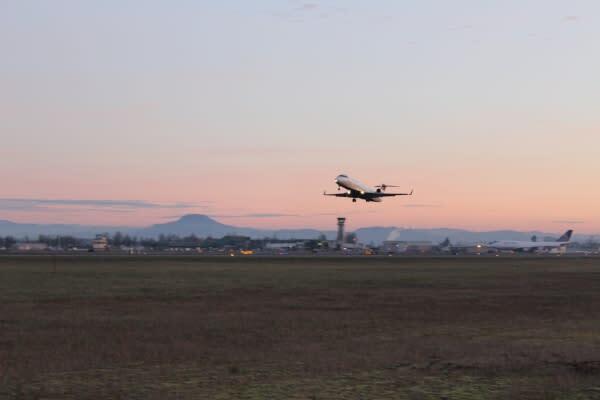 Bearing the title of the second largest airport in Oregon, the Eugene Airport (EUG) prides itself on the convenience of its location -- only 15 minutes away from the heart of downtown! Because of its fast baggage service and variety of ground transportation options, such as taxis, Lyft and shuttles, the Eugene Airport is a great choice for large groups. Plus, the staff is friendly so any questions you may have will be readily answered. An added perk of the airport’s location is the closeness of many conference hotels and sports facilities. Two popular headquarter hotels are the Hilton Eugene and Valley River Inn, each located within a 15-minute drive of the airport. Our larger sports facilities such as Autzen Stadium, Hayward Field and the Bob Keefer Center for Sports Recreation are located within 30-minutes. The Eugene Airport is also a friendly gateway to our region. Navigator Volunteers staff the information desk to assist passengers with directions and visitor information. There are dining venues both pre and post security, providing comfortable options for passing time. Browse local art exhibits and enjoy the occasional performing arts showcased in the airport lobby. The Eugene Airport makes travel easy and, by flying in here, you can get to your local destination right away without long drive times. Have a preferred airline? Eugene has it covered with six major airlines that fly non-stop to several cities. Currently, Fly Eugene has direct flights to 11 cities including Los Angeles, Denver, Phoenix, Salt Lake City, Portland and Seattle as well as numerous connecting flights. This makes it easy to find a flight that works for your schedule. 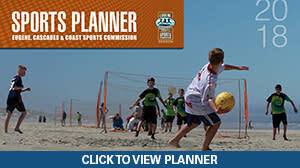 Sports teams can participate in the many recreational opportunities, unique activities and delicious restaurants Lane County and Eugene have to offer. Only an hour away is the Oregon Coast where participants can ride the sand dunes, view the Heceta Head Lighthouse or dine on fresh fish and crab. Too far away to fit in your schedule? Head over to the McKenzie River for whitewater rafting or view one of the many waterfalls in the area. Simply want to stay in Eugene - Springfield? Check out some of the amazing murals or stop to eat at some yummy restaurants! Whether you are here to coordinate, cheer or play on your team, plan extra time so you can explore all the Eugene, Cascades & Coast region has to offer! Want more tips on how to bring your event to the area? Let us help you.